So, unfortunately I didn’t get a chance to cook on Sunday. It started off as a really pretty day and I had every intention of baking a lasagna, but I went to brunch with my friends and ended up sitting in a cute French restaurant, drinking Mimosas, and watching it pouring rain outside. It turned out to be a wonderful Sunday, but the time to cook got away from me. I must have really needed a good “cook” because last night I came home from work and decided to bake something. Well, I decided to make shortbread, but when I put that in the oven, I still wasn’t satisfied, so I decided to make Peanut Butter cookies too! I was a little nervous about the Shortbread cookies because I had never made them and had no idea what they were supposed to look or feel like. It seemed way too simple…and I assumed I did it wrong. 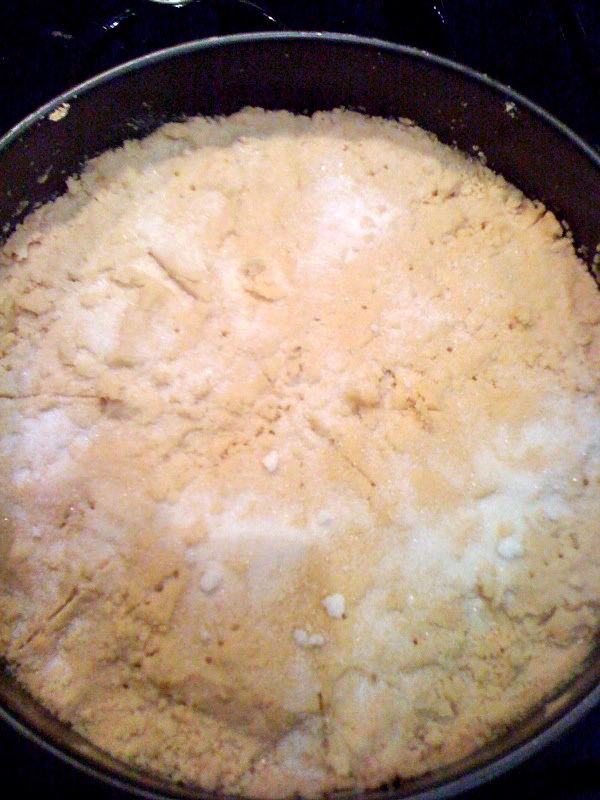 Basically, you mix the butter, salt, sugar and flour in a bowl until it forms a dough. But the dough doesn’t really feel like dough because it isn’t sticky and it kind of falls apart. It’s very crumbly. Then you just spread it in a pan, poke it with a fork a few times, and put it in the oven for about 45 minutes at 300°. 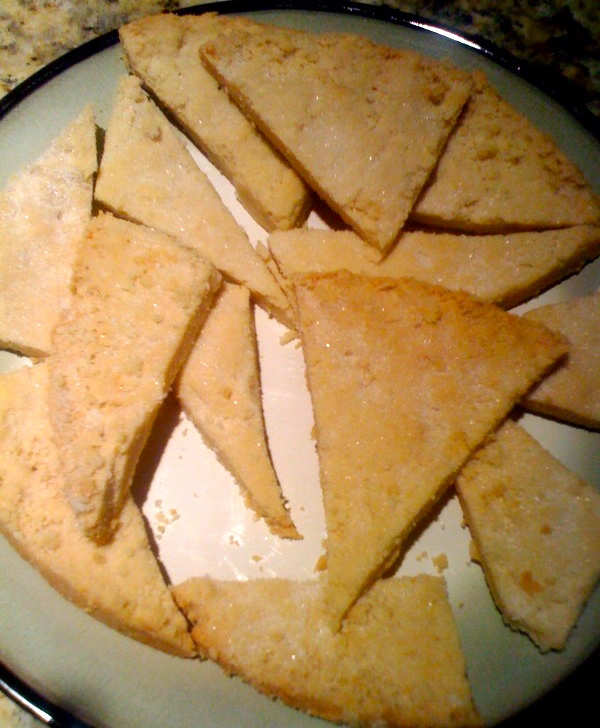 The Shortbread right out of the oven with sugar sprinkled on it! The Shortbread cookies turned out really good! As soon as they come out of the oven, sprinkle them with sugar and let sit for about 5 minutes. Then, slice into pieces (I did triangles, but you can do whatever you want) and serve! 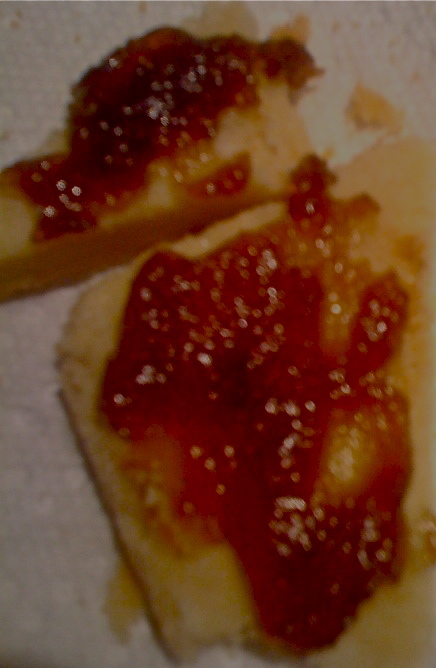 Nikki’s mom, who is a professional baker, apparently cut them into hearts for Valentines Day and spread different preserves on them! I am beyond happy to report that they were a success and everyone got to enjoy some. Nikki added some Blackberry preserve to hers and it was the perfect combination! While the Shortbread cookies were baking, I started on the Peanut Butter cookies. I didn’t have all of the necessary ingredients (oats & crunchy peanut butter), but I decided I could create my own version of the recipe and use regular peanut butter and chocolate chips instead of oats. I think that is more fun anyway! I also did not have a sifter for my flour, sugar, and salt. I knew from baking with my mom that sifting really does make a difference when baking and you shouldn’t just dump the ingredients into your mixture. I got creative in the kitchen and put the ingredients into a pasta strainer and shook it over a mixing bowl, then added the ingredients to my batter. It worked perfectly! Perfect Peanut Butter Chocolate Chip Cookies! 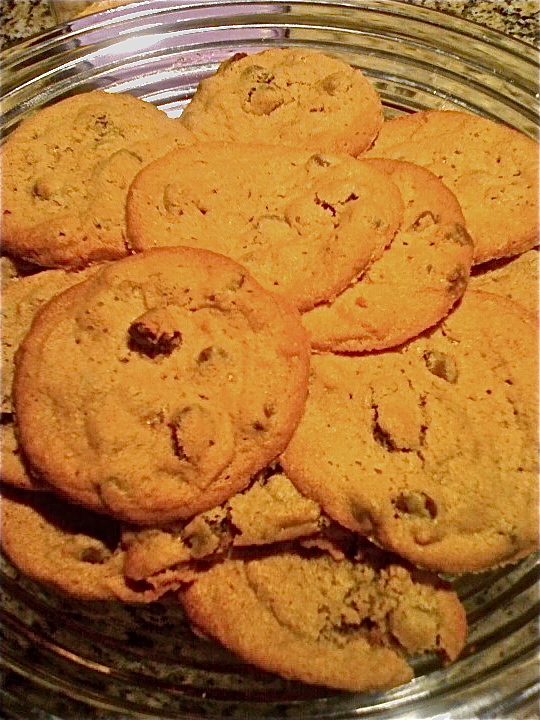 I baked the cookies for about 15-20 minutes at 350° and let them cool for about 10 minutes before serving. They were yummy. I love peanut butter. I love chocolate. And I loved these cookies. It is probably not a good thing that I now know how to bake my favorite combination of sweets! I am glad I was feeling restless last night and decided to be productive. It’s always a good feeling when you come home from work and get so much accomplished! I even went and looked at a few apartments after work because I am moving in August! This weekend I am heading back to Indianapolis (yes, I do go home every other weekend and it will continue this way until after my sister’s wedding apparently), to go to the annual Holy Rosary Italian Street Festival. The festival started the year I was born, and I have been in attendance ever since. Both sides of my family run the dessert booths and have so much fun spending the weekend together. Over the years I have had to train myself to not try all the desserts…but when you love sweets and Italian food…this place is not safe for your waist line! Keep your fingers crossed it doesn’t get rained out and if you are in the area check it out! Ladies and Gentleman Start Your…Cooking!